"The key to EMPAC" says Anderson, is the word experiment. "People are mostly used to scientific experiments." Anderson says she's gone into EMPAC with ideas that have changed tremendously because of the space and capabilities at the facility. "I'm a person who experiments," she says. I don't do the story board and shoot the movie. I wanted to do almost a comic strip, projected onto the floor really big -- so it would have almost a terrain. But that wasn't what I started to do," she explains. "I started out wanting to experiment with projecting onto three dimensional objects." Working in the space opened her up to other possibilities. "I like to experiment with pictures and sounds and see what works. Once I started making a kind of a weird Japanese silent film thing -- and it turned into a sidewalk of light. You follow your instinct." This isn't Anderson's first go-around working in a space where science and technology are paramount. During her residency at NASA she noticed that scientists and artists have a great deal in common. "[Scientists] don't know what they are setting out to make either. We're not making shoes. We can't predict what the fall line is going to be," she says. "It's not about cranking out ballets and symphony orchestras, but it's about creating and there's improvisation." Like artists, Anderson believes, scientists also wrestle with the question of how to know when a project is finished. " In order to answer that question she says "you have to kind o fknow what you're making." 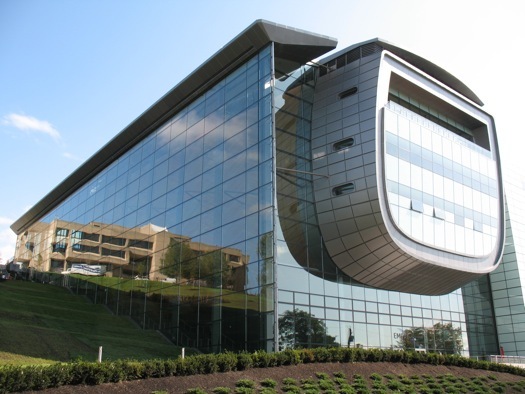 One of the things EMPAC has helped Anderson do is to work to scale -- a big advantage for someone who does such large scale installations. "It's been amazing for me. I have a nice big studio in New York, but it's not a giant soundstage or a theater." When an Italian director asked her to do a project for a theater in Italy, she was able to project that theater to scale at EMPAC to work out the piece. "That's very different than looking at models or trying to imagine what it might be like," she says. 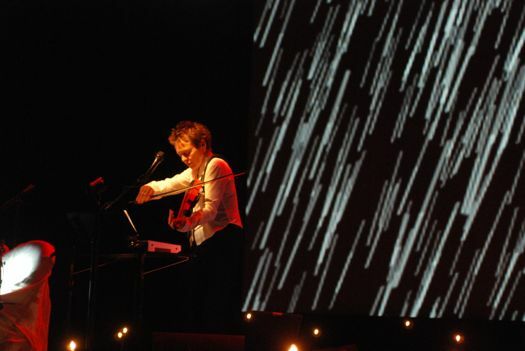 Other projects in her residency at RPI include working with musicians at RPI and Stanford to create a trans-continental music piece; Delusion, a series of stories with projections onto all sorts of surfaces that she describes as "a visual concert with music and a lot of screens talking to each other"; and compositions for the Kronos Quartet. That last piece, she originally thought, would be too big and overwhelming. "When I put it together on the computer it seemed too big, but I had a chance to put it together to scale in one of EMPAC's theaters and I thought 'It really works.' This is a huge huge thing for artists not to have to scale it up ... and it came out completely different. I was going to take all this stuff out but when I listen to the music in the space its just enough." Still, after all the work she's done at EMPAC in the first year of her residency and projects before that, she has trouble defining the building. "It doesn't have precedence. They are constantly reinventing themselves," she says. The best way for people -- artists or not -- to understand EMPAC, according to Laurie Anderson, "Go and make up your own mind and keep track of it as it grows." On Thursday Anderson will be at EMPAC showing some of her video and talking about how images relate to film. last nite's show included early music video footage of laurie: a hoot and must-see for those too young to have heard her back in the day. pauline oliveros saved the day when technical problems arose. overall, a smash bargain for $6! 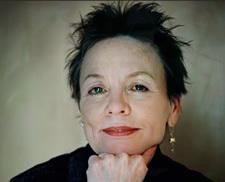 I only recently discover Laurie Anderson. Once I did, I went out and brought all of her work! Through her I also discovered Paul Amlehn. Some of her musicians also work on his project. They are wonderful both of them!